Speaking at the Young Speakers in Agriculture contest during the Calgary Stampede week, Tia Schram had a few topics she could speak about. She chose the prompt about what the next big thing in agriculture was. 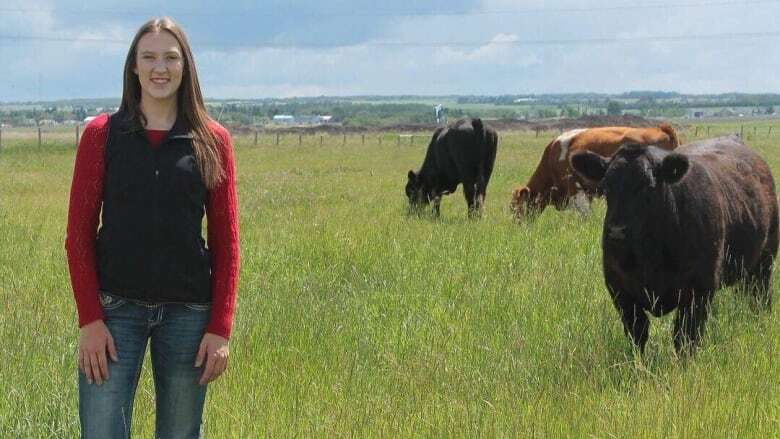 But the 18-year-old, who grew up on a farm near Bruderheim, didn't talk about new technology or innovation; she talked about mental illness in the industry. Her speech was inspired by her 25-year-old friend, who she lost to suicide in April. "Mental illness is definitely an issue that strikes close to home for me," Schram told CBC's Radio Active. "When you really open your eyes to it, you see that there's more than just him affected by it and I thought it was something very big that needed to be brought up." Schram said farmers face many challenges, including long hours and little help. There are also more uncontrollable factors, including the market for the product they're producing and extreme weather. But Schram wanted to highlight a fifth and most preventable obstacle: what she calls the "cowboy mentality." "Farmers have a lot of pride and they never want to ask for help," she said. "They think they can do everything on their own and I think that really plays a role in being able to communicate concerns about mental illness." Schram's speech detailed three other role models in her life who attempted suicide in 2018 alone. It's an issue that is much more widespread than people are letting on, she said. But the increased acceptance of mental illness in other professions and parts of society has spilled over a bit to agriculture, Schram said. "It's definitely grown in the past year," she said. Schram said the farming community is already a big support network, in that if a farmer needed a hand with anything, there's a community of surrounding farmers to step up. But that network is hardly utilized when it comes to talking about mental illness. The first step to help the agriculture industry with mental health problems is communication, Schram said. "[It's about] making it OK to not be OK," she said.